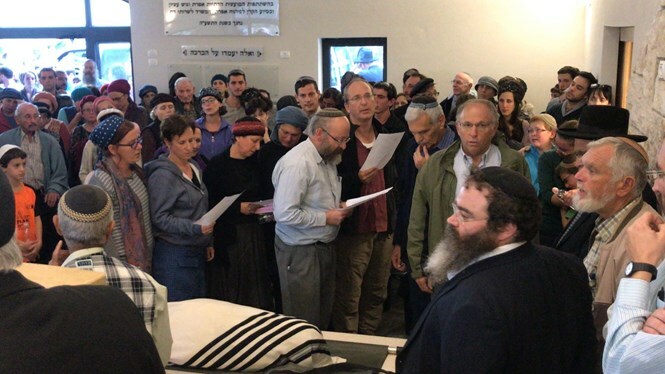 Home > Secteur-English > General > The funeral of Rabbi Yisrael Rosen. The funeral of Rabbi Yisrael Rosen. Rabbi Yisrael Rosen, leading Religious Zionist figure and innovative head of the Tzomet institute, laid to rest in Gush Etzion. The funeral of Rabbi Yisrael Rosen, the head of the Tzomet institue which innovates halakhically sttringent technological solutions to questions in Jewish law, is currently underway. The first of those eulogizing the rabbi was Rabbi Gidon Perel, rabbi of the community of Alon Shevut where Rabbi Rosen lived. "Everything you did was for the sake of heaven." "You were brimming with Torah and life. You established the conversion administration, a labor of love, and you invested hours and money without compensation. You merited in this way to [...] establish many Jewish homes. You merited to establish the Tzomet institute, and you helped greatly in finding personal and public solutions through innovative technology so that people could fulfill Jewish law." "We have lost a friend, a brother and scholar, and for this we weep." The rabbi of Ramat Gan, Rabbi Yaakov Ariel, said, "It’s hard to stand here and eulogize a trailblazing scholar like Rabbi Rosen. There are few whom the nation of Israel owes its thanks like it does Rabbi Rosen. He had opinions, but in applying halakha, he consulted with the Torah giants of the generation of all sectors, and thus garnered the respect of all Torah-true streams and groups in the State of Israel and the world." "We will continue to walk in his path."